Velma Celli you’ve done it again with your latest show Equinox. Completely under your spell and I know I’m not alone in this regard! As a general rule, I never ask stars for photos and I don’t do queues. There aren’t many people or things in this world that would entice me to arrive super early to be at the front of the queue. Oprah when I was invited to her Sydney appearance at the Opera House, the Lindt Chocolate Shop opening when there’s a kilo of free chocolate on offer and…. last night it was very much Velma Celli for her latest show Equinox. So much so, that I lined up for a photo afterwards. Something Oprah didn’t achieve. 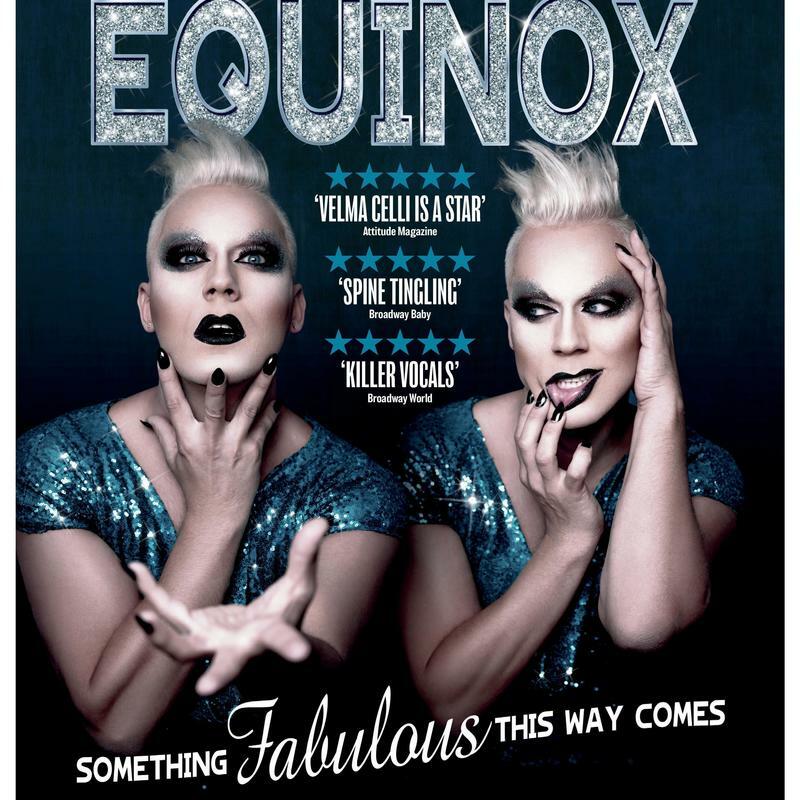 For those not in the know, Velma, UK’s Queen of live vocal drag, is the alter-ego of West End star Ian Stroughair. Stroughair has appeared in hit musicals such as Cats and Fame and most recently, received critical acclaim for his portrayal of Angel in Rent and I’ve been under his spell since he first appeared at Fringe World Perth last year. and spiel we visit all of our favourite witches from theatre, film and pop culture. Truth be told after Velma’s A Brief History of Drag performance last week (REVIEW HERE), the little spare time I’ve had this week in between Fringe shows, reviews and playing the solo parent gig to three with hubby away at sea, I’ve spent trying to jiggle my schedule, so I could slip in more Velma. That’s not to say there aren’t 19 other Fringe shows on my wish list, that I’m probably not going to find time to see and countless others that have flown under my radar because I honestly haven’t had time to go looking too hard. It’s the intoxicating and infectious energy in the room when Velma is performing, that has me, once more, completely under her spell and desperate for more. Even with a major opening night hiccup falling in Velma’s lap with the backup vocalist literally losing her voice at the eleventh hour, seeing Briony Barratt step in and rise to the last-minute challenge, Velma’s star quality shines through. Having gone almost overnight from the finely tuned to perfection, high energy show of A Brief History of Drag, Velma moves to the more vocally challenging, musical theatre part of town, hardly missing a beat. A more intimate and slightly longer affair than the show before, something Velma’s growing fan base has been craving, I know Equinox is going to go from strength to strength. Having walked away from opening night, even more impressed, after this Perth and I believe world premiere, I’m even more in love with UK’s Queen of live vocal drag and the man behind Queen Velma. I was equally impressed with the show’s pianist, Joe Louis Robinson, who also provides backing vocals with just the one other backup singer. Both equally talented in their own right and both appearing to be having far too much fun working alongside Velma, it hardly seems like work. I can only imagine, had the production gone ahead with the original and more rehearsed backing vocalist lineup, I would have been even more blown away. Aside from the absolute killer vocals, Velma sprinkles her drag queen charm across the whole room. It’s this charm and Velma’s evocative nature that means the show is as engaging as it is entertaining. My only disappointment last night… there really wasn’t a chance for a standing ovation and I wanted that chance. Velma was, however, more than generous with her time directly after the show, with everyone that lined up to get a moment more with the Queen. If time allowed, I could easily front up night after night for more. I suspect much like A Brief History of Drag or a fine bottle of red wine, this show is only going to get better with time and I can’t wait to see what comes next. Also seriously hoping that Velma returns to Perth next year or Ian follows in Ben Elton’s footsteps and finds his soulmate in Fremantle and NEEDS to move here permanently. Off now to find out if Ian is actually single and if so, possibly do a little magical match-making because Perth needs more Velma Celli. VELMA CELLI… Come over here. There’s something about you girl, that makes me sweat. So slide over here and give me a moment. You’re one of my kind.